I think every Mummy and Daddy blogger out there is thinking about it, posting about it and tweeting about it. So I thought I'd follow suit. Last year when the Mad Blogs was on I was still a newbie blogger. Still blissfully unaware at quite how addictive blogging can become and spending most of my time either telling everyone that would listen that I just got a new comment on my blog, logging into blogger every 5 minutes to check my page views for that day or googling 'how to get more traffic to your blog'! Now a year and a bit later and I'm just starting to feel like I'm getting my head around it all, what with all the tweeting, tagging, linking, memes and comments. There are still things that I just can't get my head around but I'll get there one day I'm sure. So if you haven't already voted and you are going to then I'd just like to say that I would love some nominations for either one or (if you are feeling the love) both of my blogs . I know it's a big ask as there are so many, much better, blogs out there but if you find yourself with a space in a category then feel free to put me in. It really would make my day year! 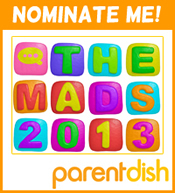 If you would like to vote or just find out more info about the Mad Blog Awards then click here. This is my first time for joining in with this so I hope I get it right. Since starting my Blog I have come across so many other great ones. Most of my free time now is taken up either reading other people's or working on my own, much to the other half's disgust. Karen was the first ever other Mummy blogger I made contact with, I have followed her blog from the start and always enjoy reading it. I love the way she always seems so down to earth and relaxed about parenting. This is Chloe's blog and It's great. She has a fab sense of humour and I always find myself laughing out loud while reading it. Always puts a smile on my face when I see she has written a new post. I find myself becoming obsessed with my blog. I spend a huge proportion of my day thinking about what I can write next. I have even gone as far as to carry a blog notebook around with me, for any random ideas or thoughts that pop up in my head. This really is addictive! In any one day I seem to have a billion thoughts going round in my head and now having somewhere to express and share that is great. I am still finding it a little hard to learn the correct blogging etiquette though. I never realsied there were so many rules to blogging. I still have so many questions about blogging, like should I only be posting once a week or once a day, am I not suppose to use pictures that I have found on the internet in my blog and do I have to comment on other people's blogs for them to comment on mine? I never realised it was quite so complicated or am I just missing something?